One of King Solomon’s key pieces of advice for prosperous living was to seek knowledge from the wise and experienced – a recommendation that’s just as valid today. 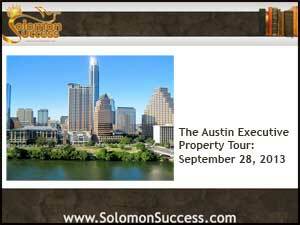 And this September, participants in Jason Hartman’s Austin Executive Property Tour will get a chance to do just that, as a team of local property experts and investing advisers gather to answer questions and offer guidance on income property investing in the hot Austin Texas market. Slated for September 28, 2013, this one-day event showcases local properties and offers prospective investors the opportunity to meet Jason’s team of Local Market Specialists, investment professionals who specialize in Austin real estate. Normally a weekend event, the tour has been shortened to just one day to fit busy schedules and travel plans. Why Austin? The area has a robust economy, and tenant rents are high in many purchase-ready homes. And since interest rates are still low, the Property Tour allows new investors to get started on the right foot with the support of Jason Hartman and his investing professionals. The Tour includes visits to available properties in the Austin area as well as opportunities to purchase and start earning money the same day. The event is limited to just 20 participants, though, so that everyone’s questions can be answered personally by the LMS team and other investing experts. Topics include property acquisition, financing, property managing, budgeting for renovation, insurance and any other questions participants may have. Breakfast and lunch are included in the $279 event price — and so is a free bonus: Jason Harman’s Creating Wealth Home Study course. A $297 value, the Creating Wealth Home Study Course offers nine hours worth of intensive real estate learning, with lessons on how to avoid negative cash flow and leverage for financial independence, ignore the chatter of “financial gurus” and find the properties and markets that make sense for you.